2010, Simon V. et al. 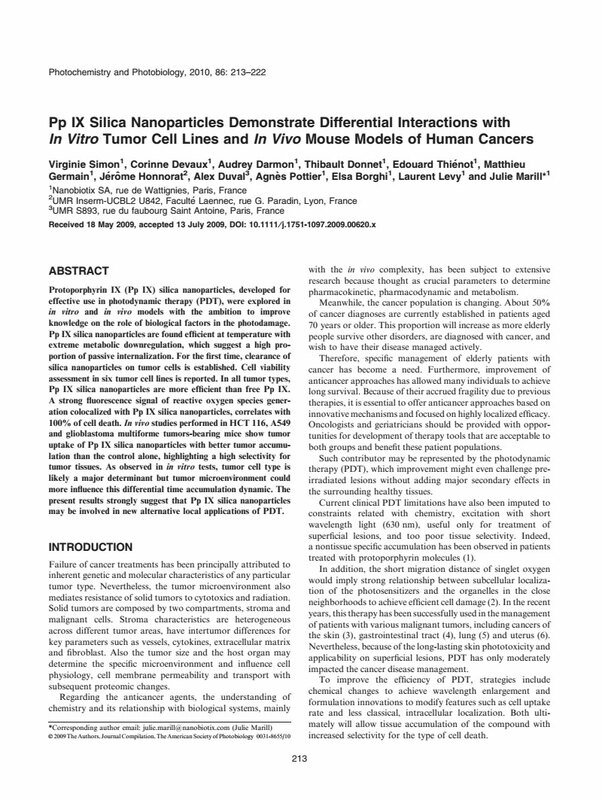 Nano Publications > Publications > Miscellaneous > 2010 – Silica Nanoparticles – Simon et al. Protoporphyrin IX (Pp IX) silica nanoparticles, developed for effective use in photodynamic therapy (PDT), were explored in in vitro and in vivo models with the ambition to improve knowledge on the role of biological factors in the photodamage. Pp IX silica nanoparticles are found efficient at temperature with extreme metabolic downregulation, which suggest a high proportion of passive internalization. For the first time, clearance of silica nanoparticles on tumor cells is established. Cell viability assessment in six tumor cell lines is reported. In all tumor types, Pp IX silica nanoparticles are more efficient than free Pp IX. A strong fluorescence signal of reactive oxygen species generation colocalized with Pp IX silica nanoparticles, correlates with 100% of cell death. In vivo studies performed in HCT 116, A549 and glioblastoma multiforme tumors-bearing mice show tumor uptake of Pp IX silica nanoparticles with better tumor accumulation than the control alone, highlighting a high selectivity for tumor tissues. As observed in in vitro tests, tumor cell type is likely a major determinant but tumor microenvironment could more influence this differential time accumulation dynamic. The present results strongly suggest that Pp IX silica nanoparticles may be involved in new alternative local applications of PDT.